Times have changed and the internet that was once the epitome of having your own private world has already lost its original state. Not only is your privacy lost these days, but you are even under the surveillance by a government that’s apparently trying to make sure everything is ‘OK’ well in fact, the world has become more messed up. PrivateInternetAccess has UK Servers and IPs from London and Southampton. Thanks to the ever advancing technology, we can now change things back – back to the days when you have privacy, security and freedom to surf the internet with no limitations, censorships and data sniffing practices. This is just what PrivateInternetAccess wants to achieve: to help each and every internet users all over the world to regain their internet freedom and be able to surf the web with confidence and not having to worry about being tracked. Read along to learn more about what PrivateInternetAccess, or PIA has to offer. Can PIA provide a fast and anonymous VPN service? Let’s find out. PIA is the VPN product that is being offered by London Trust Media, Inc. Not to confuse you with the word ‘London’, the company is actually based in Grandville, Michigan in the US and not somewhere in London, England. PIA therefore operates under the laws in the US. PIA clearly states on its DMCA policy page that it will abide by US copyright laws and will extend reasonable assistance to copyright owners upon receiving and extremely scrutinizing DMCA takedown notices. That being said, PIA assures users that its service is fully automated and that no user’s activities are being logged or recorded. PIA believes in protecting the privacy and security of its visitors and most especially its subscribers. PIA makes it clear that it has a no-log policy regardless of which VPN plan you purchase. PIA collects certain information to process payments and to do maintenance checks. The information that PIA collects are user emails address, payment details and Google analytics data. In terms of compatibility, PIA offers support to a wide range of devices and VPN protocols. PIA will almost always work on the most popular desktop platforms including Windows, Mac as well as Linux. PIA offers a dedicated VPN client app for Windows and Mac only. For Linux users, you may need to setup the VPN manually. PIA also offers free mobile apps for Android and iOS devices. The dedicated app can be downloaded on Google Play or Appstore. PIA allows up to 5 simultaneous connections so you can secure your browsing activities anywhere you go. For VPN protocols, PIA supports SOCKS5, PPTP, L2TP and OpenVPN. What’s great about PIA is that it lets users choose what type of encryption they want to use. PIA allows users to choose Data Encryption (AES, Blowfish or nothings), Data Authentication (SHA-1, SHA-256 or no hash code and Handshake Encryption. Users can also choose the Connection type (UDP or TCP), Remote Port and Local port. If you are not sure about these settings, simply leave them as default. PIA also allows port forwarding on certain servers. The PIA software is pretty simple in our opinion. Simple in a sense that it does not look fancy at all like other VPN apps. But we actually love the simplicity of the PIA VPN app – it has all the necessary features like DNS Leak protection, Kill Switch, IPv6 leak protection and server selections. In the entire VPN market, PIA’s client app seems to be the easiest software to use. What’s better than a simple and easy to use software? Cheap VPN plans! Aside from the fact that PIA offer loads of VPN features, they are also offering their high-quality VPN service for a lower price compared to the other big names in the VPN industry. PIA offers a VPN plan for as low as $3.33 per month! If you purchase a PIA VPN plan for a month, you will only pay $6.95. Of course PIA offer discounts on multi-month / long term subscriptions. Subscribe to PIA’s 6 month plan and pay $35.95 only. If you want to save more money, then get the annual package that only costs $39.95 or $3.33 per month. There is no free trial but there is a 7 day money back guarantee on all VPN plans. In all fairness to PIA, they do offer one of the cheapest rates in the market. 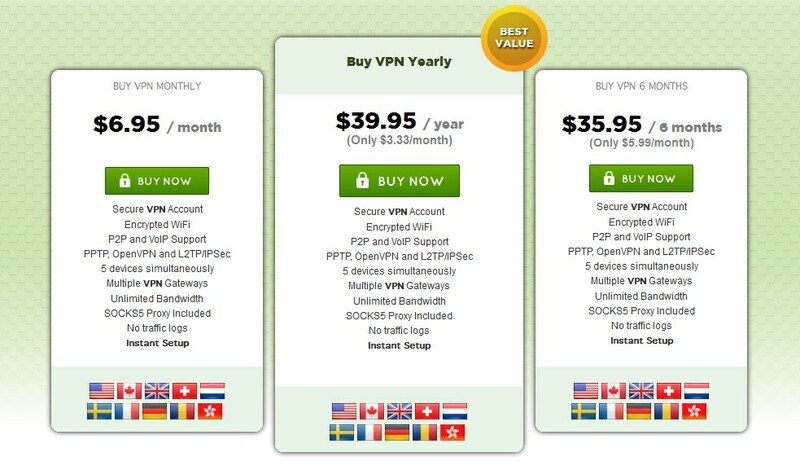 You can’t get any cheaper than $3.33 for a reliable, trusted and fast VPN service. PIA has a worldwide server presence in major cities in 18 countries. The servers are located in US, UK, Canada, Australia, Netherlands, Switzerland, Sweden, France, Germany, Russia, Romania, Turkey, Hong Kong, Singapore, Japan, Israel, Brazil and Mexico. The VPN service also said that it is backed by multiple gateways (2911+) with VPN tunnel access in the US, UK and Switzerland. PIA claims to be powered by a tier-1 multi-gigabit private network. PIA has a pretty extensive knowledge base and tutorial guides. What PIA needs to work on is improving the website interface – it’s really frustrating and confusing to find the right links / pages on the website. PIA offers a live chat feature that is readily available 24/7. We tested the live chat support and we’re really pleased by how prompt and dependable the support agents were. PIA may also be reached via emai (support ticket) which has an average response time of 10 hours. As far as speed and performance goes, PIA consistently provided us with high rating test results. PIA offers unlimited bandwidth and it allows P2P filesharing too. P2P users need not worry about anything since PIA is using shared IPs which means it would be a lot harder to exactly pin point whose doing what. What users need is a safe VPN service. Something that is truly reliable, something that won’t sell you out to any third-party. In our opinion, PrivateInternetAccess is worth every penny. PIA is the VPN service with advance features that can truly help hide user activities. If you’re looking to become anonymous online, then we advise that you give PIA a try.